As you know, I’ve been working away on some updates to my mudroom this year so far – check back in tomorrow to see the progress on the built-in bench and cubbies! Both before I designed the new built-in and while I’ve been working on it, I scoured Pinterest for ideas I could utilize in my own space and have rounded up ten smart, stylish mudrooms to share with you today. 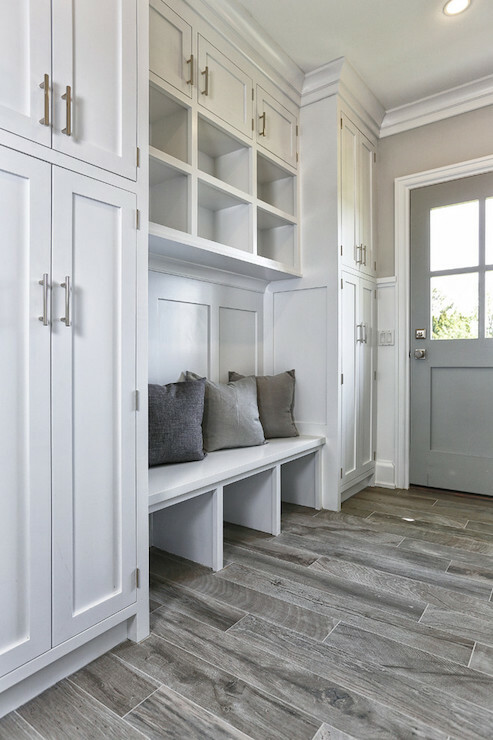 There’s no shortage of gorgeous mudrooms out there, but these all had actionable takeaways for me – smart storage or beautiful features that I could see myself or others applying in our homes. Shall we take a look? 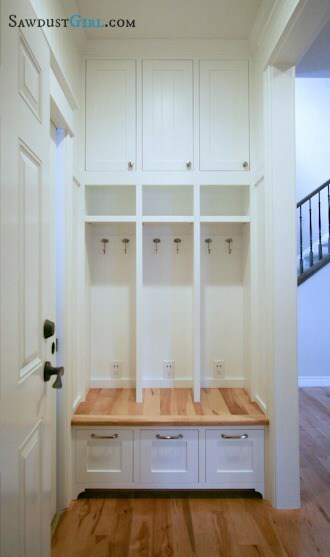 This first mudroom is simple as can be but there is something SO striking about it. Want to know what makes it so arresting? The chrome lantern pendant and planked ceiling don’t hurt matters but it’s those deep black doors and windows that really catch the eye here. This image inspired my plans to paint the doors in my mudroom an inky shade of black. We’ve got another black door here, but what I loved most in this mudroom was the big basket of sports supplies. My girls are just getting into playing some different sports and I’m already feeling a little overwhelmed by the tennis racquets and lacrosse sticks and soccer cleats. I love the large basket to hold them here – it keeps everything in one central place that’s easy to drop when kids come in the door and easy to grab before they run out again. Well, clearly I have a thing for black doors. But as with the previous image, it was a few other features that caught my eye here. First, the narrow cubby dividers. Because of doors on either side of the space where I’m building the new cubbies, I had about 7 1/2″ of depth for the dividers. I thought this would look fine, but wanted to see an example before moving ahead. This image confirmed that design for me. I also love the dusty green color of the bench and cubbies. I’ve been pretty sure about painting my new built-ins white…but this has me considering some color. I love that it’s a muted color but one that you don’t see everyday, which makes it eye-grabbing. 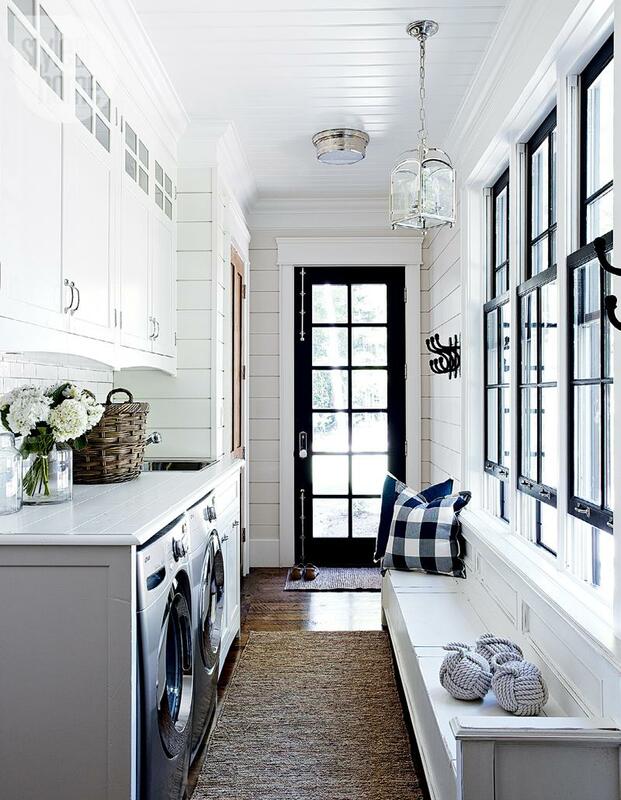 And mudrooms are called mudrooms for a reason – in my experience, they get dirty fast and white shows every speck, while a darker color would conceal some of the grime. The last piece that I really love here is the black and white family photos above the cubbies. I’ll have a ledge like this and have been wondering what to prop on it. I think this may be just the thing. Once I started considering alternatives to white for my built-in, I found a few other mudrooms with soft but standout colors. This warm gray is such a rich color and I love the subtle contrast against the white. I also love the bench shape here if you have a corner to work with. 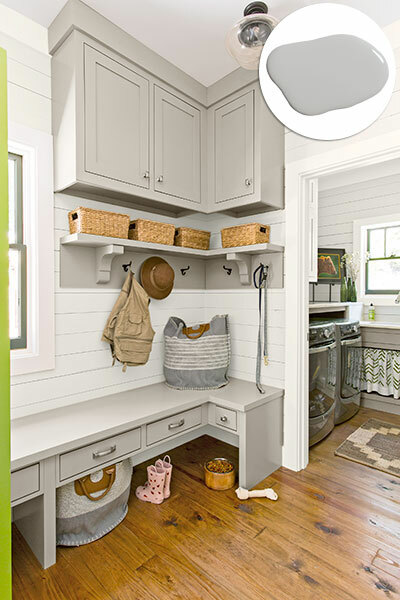 Here’s an even more subtle use of color on mudroom built-ins. I love the triple hooks in each cubby here. The sides of my new cubbies are shallow but I’m still hoping to add an extra hook on each side to literally triple the storage in each space. 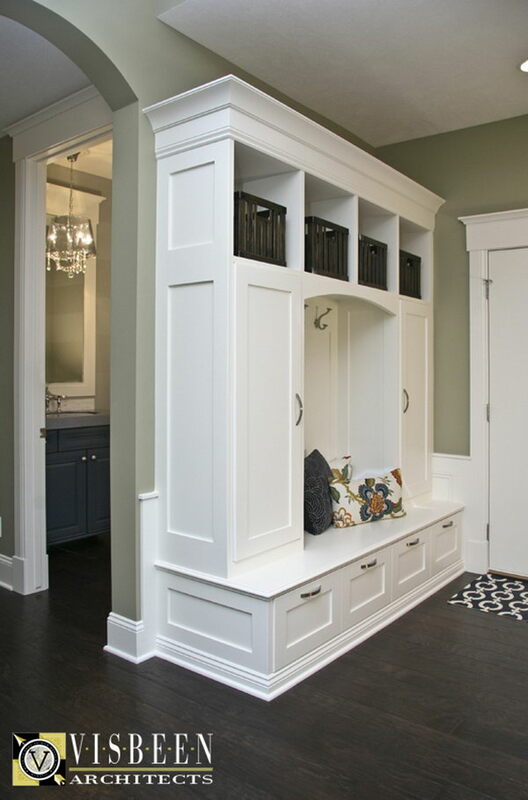 This next one is an example of a classic, polished mudroom built-in unit. I love the concealed storage here and how neat everything looks. I couldn’t work any concealed storage into my mudroom project but I think it’s a brilliant way to keep messiness out of sight! Here’s another example of a mudroom built-in with concealed storage, but on a slightly smaller scaler than the previous one. This one has additional drawers below the bench area, which is a nice, custom alternative to shoe baskets if you can work them in. One element I took from this built-in and the previous one is the wainscoting panels on the sides. I love wainscoting details just about anywhere and knew I wanted to add some to the new built-in I’m working on. Speaking of drawer storage, you have to check this project out. Drawers are super tricky to make yourself, so rather than start from scratch, this built-in unit is created with a foundation of……..two Ikea TV consoles. Utterly brilliant. Because of a heating baseboard I couldn’t have a solid bottom like this but I absolutely love this idea! 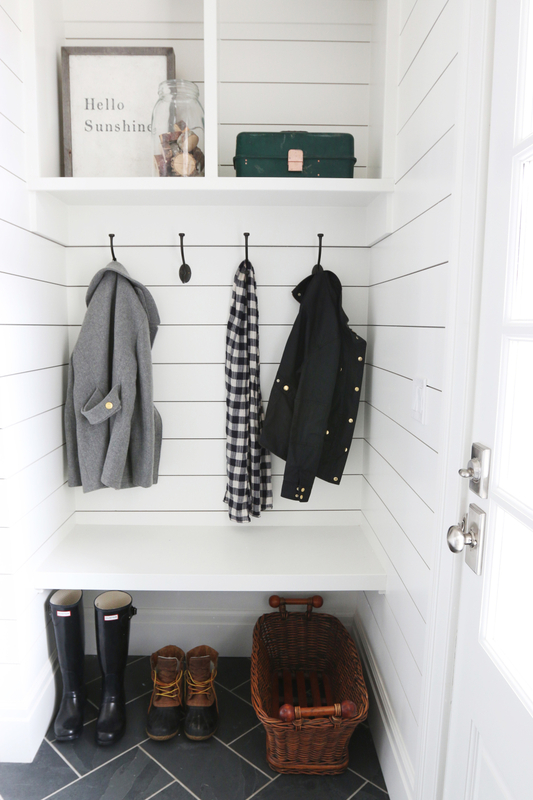 Small space doesn’t mean you can’t work a mudroom area in. This one does it brilliantly, with a wall to wall bench, hooks, and shelving above. The planking on the wall defines the space as its own little “room.” Tiny and perfect. Here’s another example of a small space being used to maximum advantage. The built-in goes floor to ceiling and each of the cubbies even has its own charging outlet. So smart. This is a pretty great before and after if you click the source link below the photo. Are mudrooms popular where you live? They were not even on my radar until I moved to New England but here it seems everyone has one. My last house did not and my current house does and I can tell you it has been a game changer having that drop zone for everything when we walk in the door. I’m so excited to be making that little room work even better for my family. 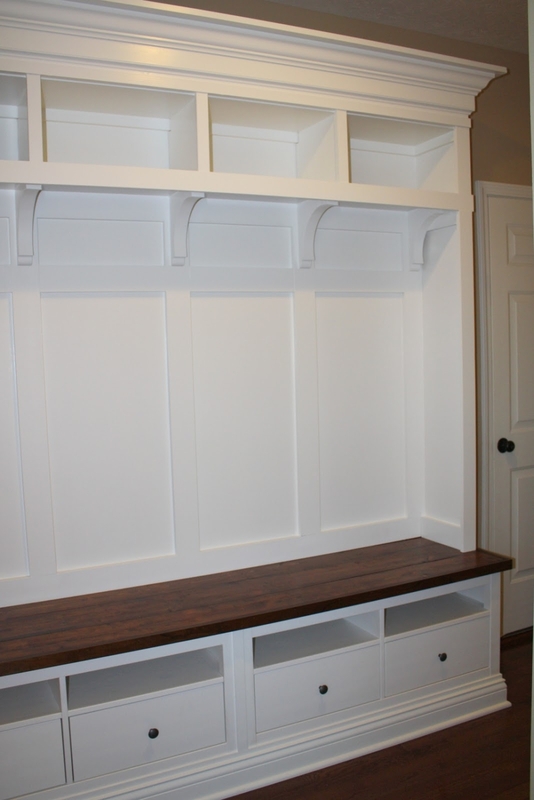 Don’t forget to stop back tomorrow to see how things are coming along with the new mudroom built-ins!